My name is Des McCready and I am a qualified College Lecturer and part-time Colonic Therapist in my thriving Colonic Clinic (which had been located in the village of Moira for over 3 years but re-located in December 2007 to a ‘state of the art’ brand new Clinic at my home in the city of Lisburn (about 15 mins drive via Motorway from Belfast, 5 mins from Lisburn City Centre or 20 mins from Belfast International Airport – see Directions posted on website). 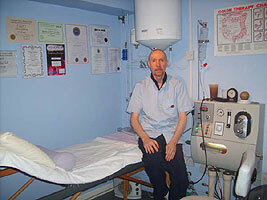 I have been interested in a wide range of Complementary Therapies for over 30 years and hold Diplomas in Colonic Hydrotherapy (from Scottish School of Colonic Hydrotherapy and 1-ACT (International Association of Colonic Therapists), Diploma in Nutrition (VTCT), Diploma in Anatomy and Physiology (SNHS), a CIBTAC Diploma in Ear Candling and an OCR Certificate in Counselling and I am a Member of ARCH (Association and Register of Colonic Hydrotherapists). I first became interested in Colonic Irrigation 14 years ago when I experienced the tremendous benefits of the treatment for bloating / wind – which I suffered from for quite a few years. Regular Colonics (every 2 months), plus the maintenance of a sound dietary regime keeps me extremely fit and energetic and I want to help others regain optimum health through colonic irrigation and sound nutritional advice. Feel free to e-mail or phone for further information or to book an appointment. You will be assured of a totally professional and friendly service in my Clinic.